Last year, minutes after Villanova defeated North Carolina on a buzzer-beater to win the NCAA title, CBS play-by-play man Jim Nantz took the tie from around his neck and gave it to Villanova senior Ryan Arcidiacono. At the time we called Nantz—who explained that it was a tradition to honor his father, who taught him to tie a tie and died in 2009 after suffering from Alzheimer’s—“a tremendous weirdo” for doing so. Yaron Weitzman profiled Nantz, and his tie-giving-away tradition, for The Ringer. Weitzman writes that “this story was supposed to be one poking fun at Nantz,” and examining the rich white guy who makes millions giving away ties to the mostly-black unpaid labor who generates that wealth, but in the course of talking to Nantz and some of the players who received a tie, the focus shifted. Along the way, Weitzman gets some pretty funny anecdotes, like Nantz trying very hard not to brag—“I’m not, in any fashion, comparing my little world as a sports commentator to what they do”—while bragging about his friendships with most of the living former presidents, and being unable to remember which players received the tie in about half of the years of his Very Important tradition. Anyway, the Deadspin staff had pretty divergent reactions to the piece, and our discussion about it devolved into whether the piece was criticizing Nantz or not, the value of the writer pointing out why somebody is bad versus giving them enough rope to hang themselves, the perils of writers wanting to believe athletes think the way they do, how sports fans read stories as opposed to how sportswriters do, and assorted other topics. 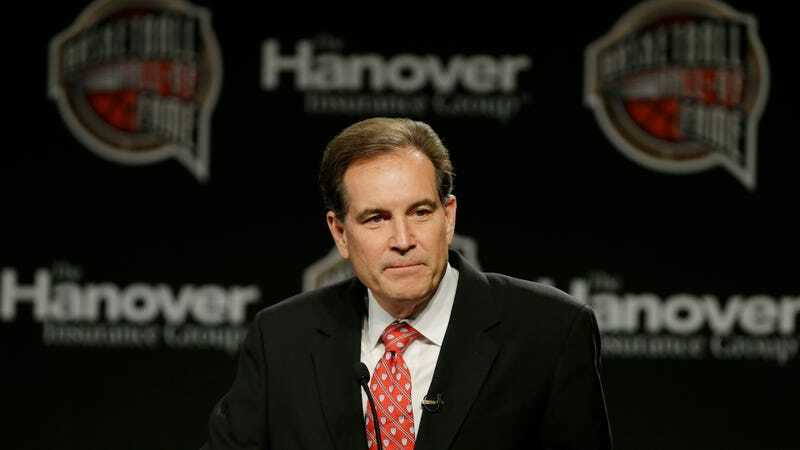 So, we ask, what does this profile make you think about Jim Nantz?